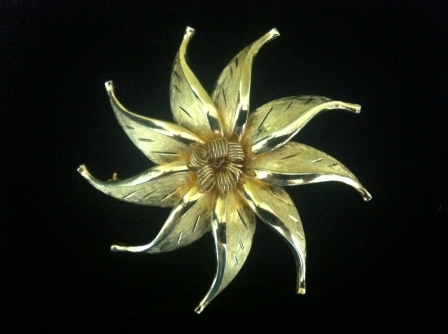 Gold sunburst pin signed by designer, Kramer. Founded in New York City at the height of World War II, Kramer Jewelry Creations produced intricate and artistic pieces out of gilt metal, rhinestones, glass, and enamel. Louis Kramer, who started the company in 1943, was later joined by his brothers, Morris and Harry, as he tapped into the burgeoning costume jewelry market. All aspects of the business took place in New York City, so the pieces were marked “Kramer,” “Kramer N.Y.,” or “Kramer of New York.” In the 1950's and 1960's Kramer also designed for Christian Dior.